Powder to Cream Foundation is paraben-free and dermatologist tested. Ingredients: Glycerin, Propylene Glycol, Silica Silylate, Adipic Acid/Neopentyl Glycol Crosspolymer, Water, Benzimidazole Diamond Amidoethyl Urea Carbamoyl Propyl Polymethylsilsesquioxane, Cellulose Gum, Sodium Polyacrylate, Phenoxyethanol, Silica, Alumina, May Contain: Iron Oxides (CI 77491, CI 77492, CI 77499), Titanium Dioxide (CI 77891). Was intrigued by the presentation I really thought this will be another foundation to go to the graveyard. I am so impressed I have fine lines and it looks so good on I love it. It makes my face look smoother. My favorite. I had been using It Cosmetics CC full coverage cream foundation. 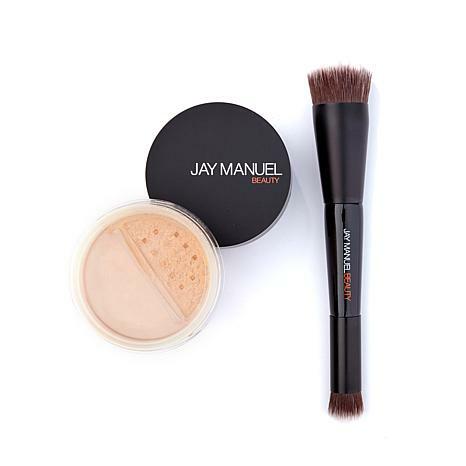 Jay Manuel foundation has a wonderful texture even on drier skin. It doesn't look cakey and I use light 3, a very nice color choice. It lasts all day which is important to me. I have a long work day and commute. Looks very natural and not thick at all. I've been a fan of Jay Manuel foundation for it's full coverage for years now. I've only used the liquid foundation in the past and decided to go with the powder to cream foundation with Kabuki brush - simply for the foundation brush. Let me just say, the brush alone is worth the money itself. But I'm a fan of this foundation as well. It goes on smooth and powdery and ends up with a flawless finish just like the liquid foundation. I definitely recommend this. I would use both foundations. I really do love this product it does do the job. SoFla is humid and I always hace trouble finding make up that stays on but doesnt clog my pores too much.This is great for Miami. I love the make up brush too. Just wish it lasted a little longer. Remind me about Jay Manuel Beauty upcoming shows.